Excel Services Fix – "The workbook cannot be opened". When I tried to open any excel file in SharePoint, I was facing below issue: Excel Services – "The workbook cannot be opened". After spending some time on checking configuration settings of Excel Service Application, I found root cause of the issue was permission to Service Account under which Excel Service is running. It does not have enough permission to Content Database of Web Application. To fix the issue, follow below steps and execute PowerShell Commands. 1. Click Start, click All Programs. 2. Click Microsoft SharePoint 2010/2013 Products. 3. Click SharePoint 2010/2013 Management Shell. 1. Add Service Account user to Content Database of the Web Application. 3. Assign full control permission to the Service Account user on the Web Application. 2. Select the application pool “Excel Services Application”. 3. You will find associated Service Account with application in other dropdown. In large SharePoint Environment, we have hundreds of Site Content Types in site collection. And the requirement was to add new site column to all site content types of specific group. Yes, first thing comes to mind is, lets add it to content type one by one through GUI. But it is not feasible approach while dealing with hundreds of content types as it becomes very tedious task. So, I have decided to implement PowerShell script through which it can be added to all content types of specific group at once. $site = Get-SPSite "<Site Collection Url>"
I have a SharePoint List containing task items. Tasks are assigned to a specific SharePoint Group or individual user. Each group has its own members. 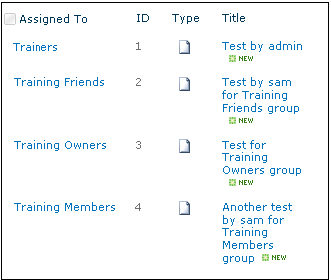 Requirement is, if current user is member of any of those groups, can see assigned tasks under My Tasks View. There are few possible solutions, one of them is to modify Query filter via SharePoint Designer. Open SharePoint designer then open site. Select the Task List under Lists and Libraries. (For example, here we have selected "ResourceDocumentTypes"). Note: If you cannot edit file, you must select advanced mode. Be sure to change the "FieldRef Name" to your own field, and click Save. Done! Now, User can see all task items where “AssignedTo” field contains a SharePoint Group that logged in user is a member of and also assigned to him/her directly. 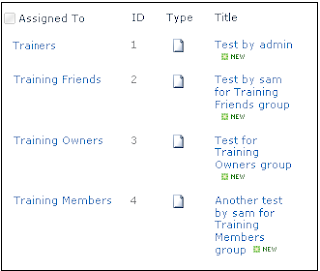 Below is filtered list view showing only tasks assigned to SharePoint Groups for which current user is a member. It's the frontend toolkit for building UI of custom application same as Office and Office 365 products. Microsoft uses Fabric UI throughout Office to create functional and engaging user interfaces. Now that Fabric UI is open source, we can find it on GitHub and apply the same Office Design Language to our own web applications. With Fabric UI, we can create an engaging customer experience and save development time. Office UI Fabric is a responsive, mobile-first, front-end framework for developers, designed to make it simple to quickly create web experiences using the Office Design Language. The framework is used internally on products within Office 365 — such as suite branding, OneDrive.com, Outlook.com, Delve and the Video Portal. With Office UI Fabric, you can apply simple CSS styles to make your web applications having same look and feel as Office products.The styling takes into account of typography, color, icons, animations, responsive grid layouts and localization. Typography: Typography includes CSS classes that you can use to implement the same text that is used across Office. Color: Use Office theme colors, neutral colors (different shades of gray), brand colors for different products & accent colors. All of these come in background, text, border and different shades. Icons: If you are familiar with Font Awesome, the Office UI Fabric includes icons that are specific to Office, including product logo. Animations: Want to mimic the same animations Office uses? just add a CSS class! Responsive grid: It follows the popular 12-grid format. Localization: It includes right-to-left support for those languages, such as Hebrew & Arabic, as well as language optimized fonts. Buttons, Drop-down lists, Radio buttons, Check boxes, Form fields, Search boxes, Toggle switches, Text fields, Lists, Dialogs (with overlay), Callouts, Navigation bars, Pivots, Personas, Tables. Follow below steps and use below HTML & CSS code to include "To Do List" section in SharePoint Page. Add a reference to fabric.css in the <head> of your page. Make sure the path is correct. If you're using components, add a reference to fabric.components.css after the fabric.css reference. Add below HTML code in HTML file and css code in separate .css file and upload both files in Site Assets folder. Add Content Editor web-part on page and set the HTML file url in Content Editor link. Can have same look and feel as Office products. Integrates with other frameworks, like Bootstrap. Built with LESS for powerful customization. Uniquely named classes to prevent conflicts. Language support (including right-to-left behavior) to simplify localization. Not as responsive as bootstrap. Documentation on GitHub for the Office UI Fabric is not nearly as complete as for Bootstrap. Alternatives of Fabric UI ? Yes. Bootstrap, Material Design, Foundation, Semantic-UI etc. There are many front end CSS frameworks to choose and the selection greatly depends on the requirements of the project.